Forgiveness is hard. I’ve been talking to someone about that today and dug up these posts from around the blogosphere. An article on what our forgiveness (not God’s) looks like. I’d call any charitable work “antibono” because I think Bono gets too much free publicity in social justice spheres already. Turtles are the best pets. They’re funny. Clean. And they do cool stuff. Like this. Most of the fun finishes about halfway into this video. But it’s only 48 seconds. 2. Work fewer hours around the work office as they undertake more family related duties. 3. Generally have less work-related experience compared with a man of the equivalent age, due to having a more disrupted career (due to family commitments). 4. Have less super at retirement, due to working/earning less. 5. Have difficulty getting into higher work positions, sometimes linked to the impact of family duties on work commitments or a disrupted career path. 6. Are worse off financially, and do not have the same career progress as men. Further, this can lead to second-degree problems, such as women being financially disadvantaged when involved in a relationship breakdown, due to losing the financial security built into the family unit and having lower savings/lower future earning capacity/less superannuation than the male counterpart. This is all fair enough. However, I think it is important to recognise that the characteristics above are not necessarily evidence of different earning realisations due to pure gender-related pay discrimination. It seems that most of the arguments that stem from these points is misdirected, often mistaking inequality of opportunity or pure wage discrimination based on gender with different earning capacities due to circumstance leading to inequality of outcomes. A true example of discriminatory pay rates would be if, for the same inputs, there were differing outputs, as in for the same factors (including hours worked, qualifications, experience), there was differing pay. and at present, with the recognition of the above factors, I think the evidence being spread doesn’t align with the suggested problems, or required solutions, being touted. However, the main point I want to make is that currently it seems that the pro-equality groups direct their anger at the businesses/employers for failing to ignite gender equality. Why is it the employer’s role to do this? Businesses should not be required to fulfil social welfare redistributive role. Employers should be required to pay an employee what their work-related characteristics require. Employers shouldn’t have to act on the idea that 10 years of life experience is equivalent to 10 years of on-the-job experience. If, as a society, we want to undertake wealth redistribution on whatever grounds, there are better institutions and better ways of doing this. It is unclear exactly what the ultimate goal/solution of recognition of gender wage inequality will be. However, I think it is important to recognise the above distinctions, and most importantly, be careful what solutions are implemented, and not use business enterprises as a blunt weapon for attempting to right the perceived wrongs in society. It was self published. It features chapters from plenty of well known preachers. You can buy it here. A while back I posted a bunch of novelty toilet paper designs. You should check out that post – and these other fantastic bathroom fillers. Sometimes you just really have to go at night. And finding the light switch is hard. Glow in the dark toilet paper is there in case of emergency. Some people like to read while sitting on the toilet. My mum always warned me about hemorrhoids that occur as a result. 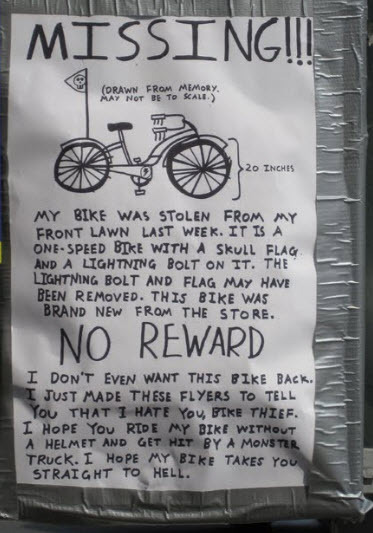 You can take that warning, or leave it. If you leave it perhaps you’d like to have some brainteasers at hand (which reminds me of the one about the constipated mathematician – he worked it out with a pencil*). Other people like to jot down thoughts and journal ideas on notepads. Artist Michael Gondry turned his notepad doodlings into toilet paper – I assume only the bad ideas made it. Polaroids are dead. Apparently. They’re no longer being made. Which is sad. Who doesn’t like a bordered photo that you have to shake? Turns out lots of people do. So much that you can get an iPhone app that turns your iPhone into a polaroid camera – you even have to shake it for it to develop. It’s called ShakeIt. Then, thanks to the magic of the internet and the extensive collection of iPhone apps to cover every unimaginable possibility – you can mail it to yourself as a postcard. Using ShootIt. If you are worried about the impending zompocalypse then perhaps the best thing you can do is get rid of your brain. The best way I can suggest to partake in that kind of activity short of a super lobotomy is to play this proposed game… Guitar Hero for air guitarists… Headbang Hero. This my friends is the Holy Grail of breakfast. 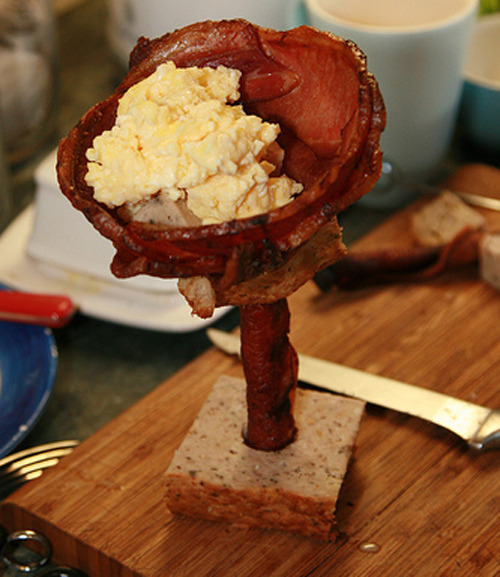 A bacon and egg goblet. Some haircuts make the bowl cut look good. 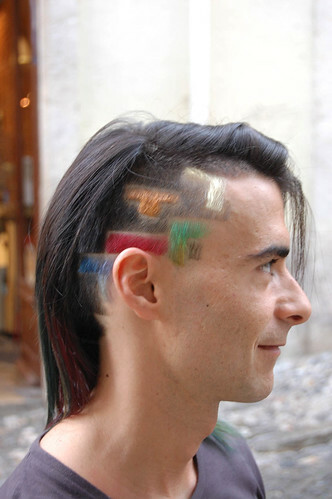 I’m torn between thinking this is the most awesome haircut ever, and some sort of geeky hobo mullet. The iMonk puts forward a little insight into how the goalposts are moving when it comes to discourse with atheists. I tend to agree with his diagnosis of the problem. “Keller is still great. C.S.Lewis is still helpful. [William Lane] Craig is still impressive. But I’m not sure their arguments are on the right channel. Vast numbers of people aren’t asking for philosophy. They are asking what will let them live a life uncomplicated by lies, manipulation and constant calls to prefer ignorance to what seems obvious. What we’ve said and written is fine. What we’ve lived in our homes, private lives, churches, workplaces and friendships has spoken louder. Diagrammr is pretty cool. It creates flow chart diagram things from sentences. I just used it to map out the logic of John 14. Because it’s a pretty layered little passage. It doesn’t quite get there… but it goes close. Check it out. It appears to save the stuff I’ve put in here – and I think you can probably change it all you like… which is a pain.